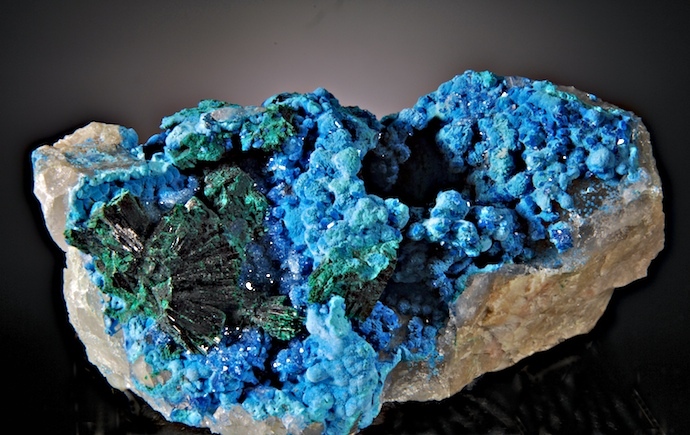 A bright sharp, gemmy electric blue Azurite from the long gone but fondly remembered finds at Touissit. This is mostly all Azurite, but there are some small Cerussites sticking out in a few spots. The Cerussites do have damage but the Azurite (which is the main focus) is in great shape with sharp prismatic terminations. Far better in person, a fine yet affordable piece. 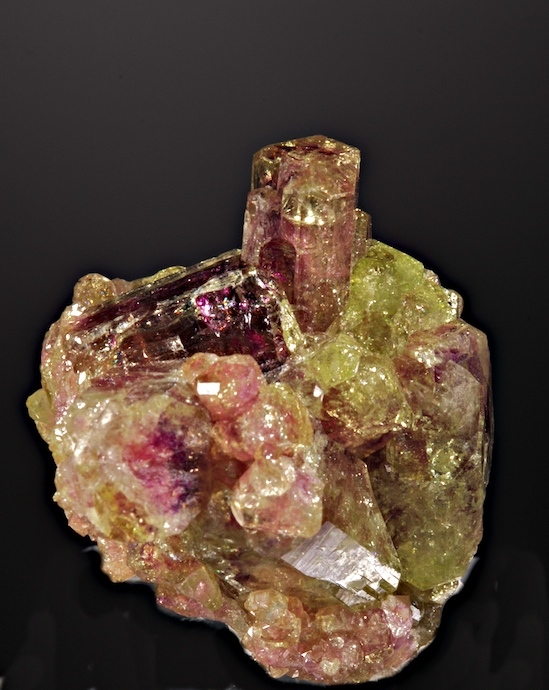 An especially bright and lustrous specimen of gemmy Vesuvianite with rare phantoms of deep purple enclosed by a lighter green exterior. In very good (but not absolutely perfect condition), what looks like damage in the photos is actually reflections inside these glass- clear crystals. There is some outside edge damage and contacts/ chipping that can be best seen with magnification, so not for ultra perfectionists, but this habit with bright color phantom is very rare. This is an excellent example. 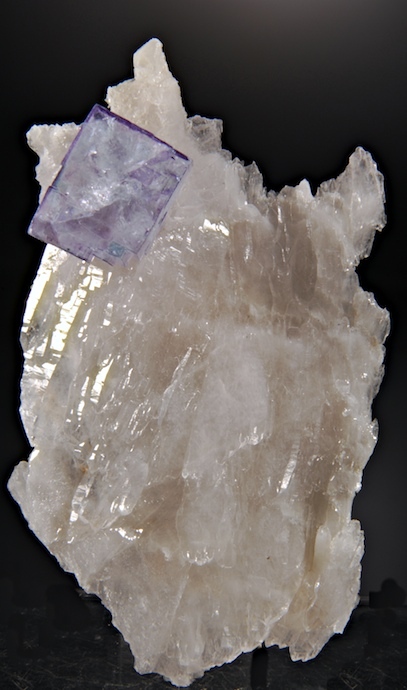 A nice, clear example of the classic Naica Mine Fluorite with beveled edge cubes on contrasting Galena. Some back edge chips are noted so this is priced to be especially affordable but it displays like a much more expensive piece. 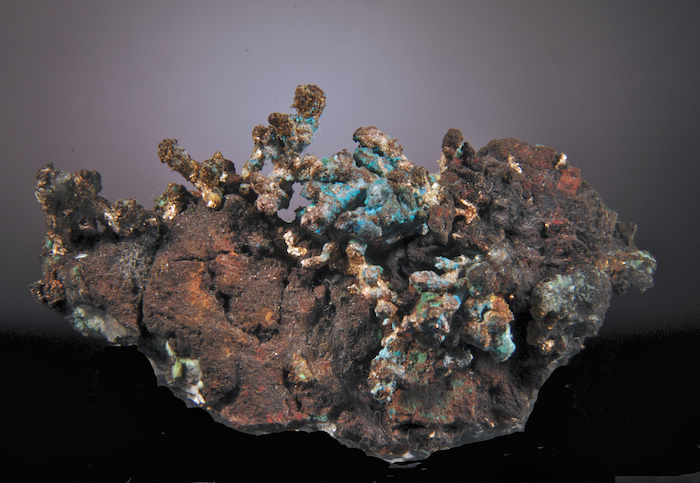 An intense color, well crystalized large Shattuckite with fine malachite sprays and sparkling luster. One of the nicest of this style, this displays well from any angle, and the color is very much "electric". This find produced the best Shattuckites ever seen and this is an especially choice example. Much more three dimensional than most and with great display impact, in fine condition. On close exam many small doubly terminated Quartz crystals are seen that are a brilliant blue color from included Shattuckite and add a lot of flash. Compared to other fine pieces this is a great value. 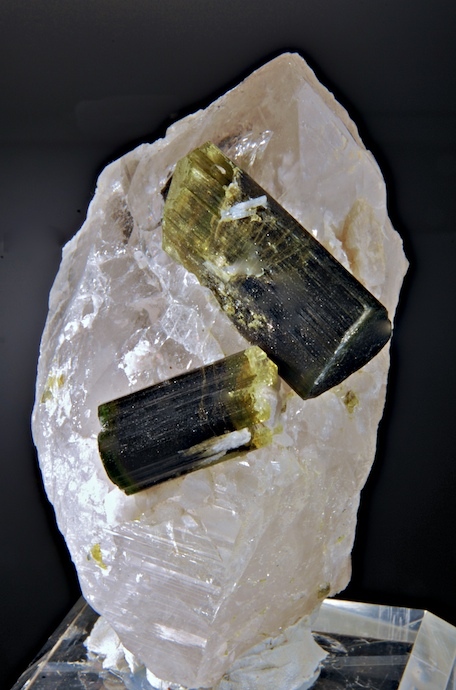 A big, clear to milky terminated quartz crystal is the host for two color zoned Elbaite tourmalines that are both doubly terminated. The Elbaites are undamaged and each shows two different habits of termination. An early Skardu piece, this style just is not found anymore. A choice, sharp, clear Fluorite cube is neatly sitting like a jewel on a flattened quartz plate that is itself complexly crystalized. An older, classic style Yaoganxian specimen Ex. Terry Szenics collection, this better quality is no longer produced and the mine is shut down. 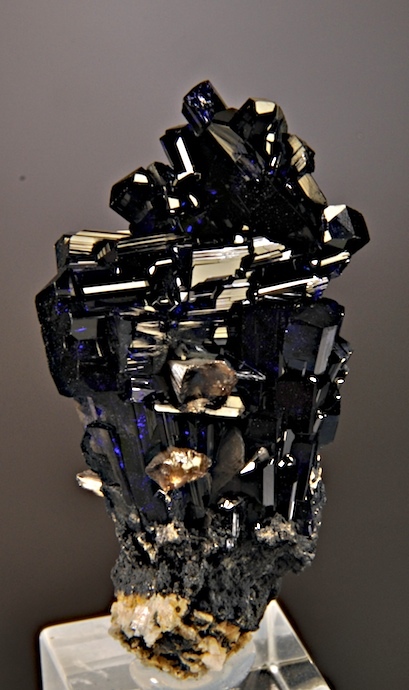 An odd yet quite attractive specimen which is very well crystallized. The matrix is mostly all copper, some of it is crystallized with flattened octahedra and some standing fingers of crystals. The main event is the Silver that is crystallized in twisting fingers and branches contrasting to the copper. A little Malachite and a blue mineral (Chalcanthite?) are visible too. The blue could be cleaned off but it adds interest as is in my opinion. The condition is perfect, the esthetics are distinctive and not typical. Intense emerald green color (not the usual deep green) often labeled as Chrome Vesuvianite is one of the rarest and most desirable. 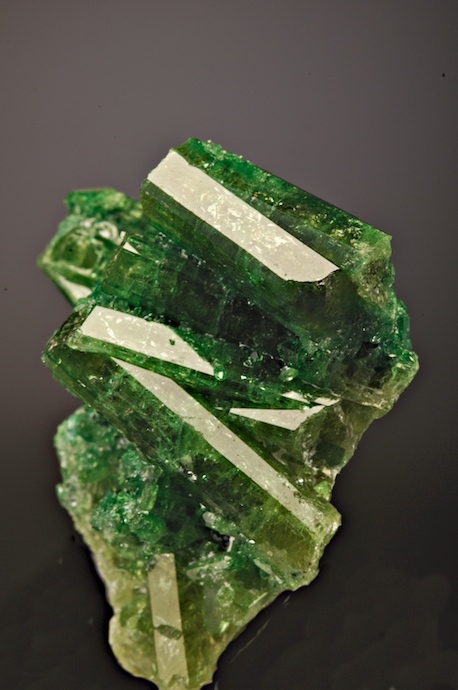 Jeffrey mine Vesuvianites are without peer in the mineral world, the color array is incredible and this green example is first rate. 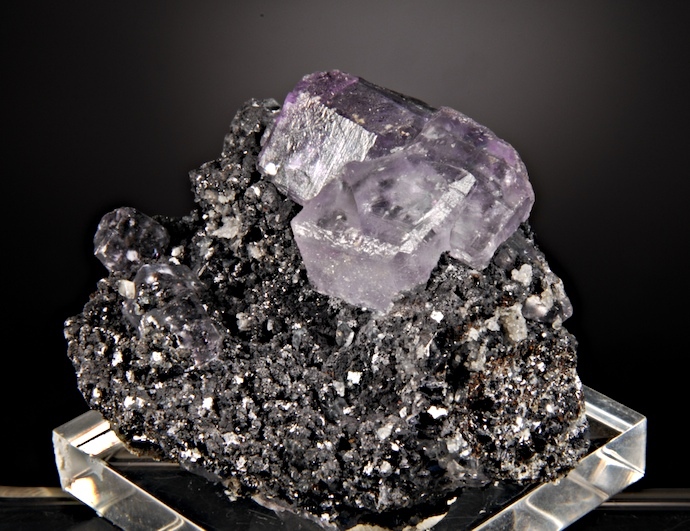 The main crystals are up to 2.5 CM, and doubly terminated but smaller ones are only singly. The terminations on most of the crystals are an unusual flat or multi stepped type that may look like damage with a quick glance . There is some damage on this piece seen when studied carefully and some evidence of re-crystallization on a few zones. Still overall this is a fine display piece as nearly all of these that exist do have at least a little damage. Far better in person.